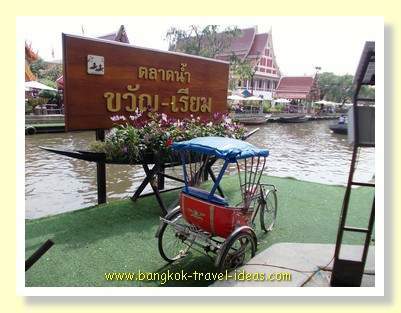 Kwan Riam Floating Market opened in June 2012 and is one of Bangkok’s newest floating markets. 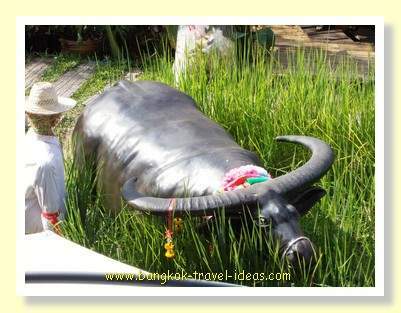 Located on the banks of Klong San Saeb in the Minburi district it is about 30 kms from Bangkok itself and is just ideal for a day trip from Bangkok. 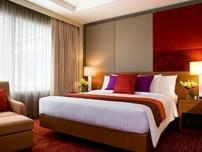 If you think the name of Klong San Saeb sounds familiar. 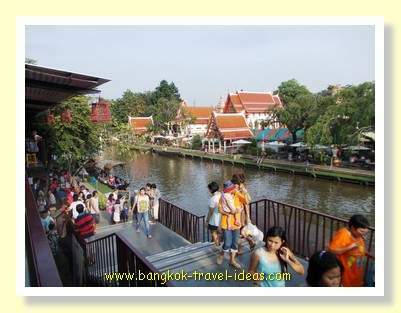 I can tell you that it is the klong that runs behind the Platinum Mall in Pratunam. 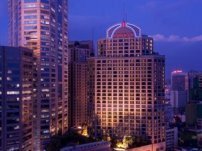 It is the one that goes under the road bridge just near to the Super Rich Thailand money exchange. As you walk towards the Platinum Centre you may have seen the canal boats beneath you and as you look out from the bridge you get to see customers taking a flying leap off the boat onto the jetty. 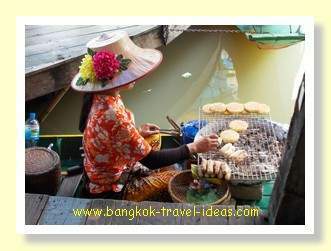 Thailand is famed for its floating markets; in fact all you need is a waterway with some food sellers, a few boats, and you can create a new floating market for yourself. If you have a Buddhist temple as well, then all the magic ingredients are there to make it a success. 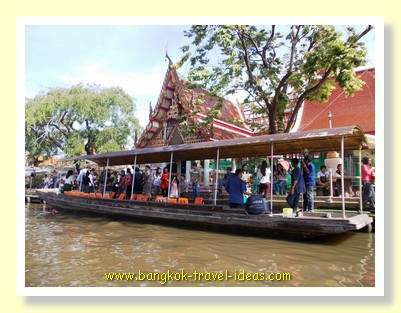 I wanted to check out Kwan Riam Floating Market to see if it was anything special, as it is not far from the centre of Bangkok and is the sort of place that tourists could get to quite easily in a taxi. 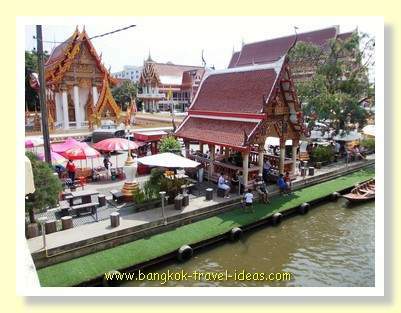 The Kwan Riam floating market has two entrances; one is located off Ramkhamhaeng Road and the other off Seri Thai Road, so depending on your starting destination you could use either one to get there. 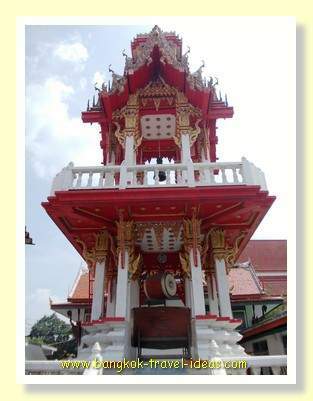 If you follow the Googlemap below or the tourist signs you will be directed out of the city along Ramkkamhaeng Road to Wat Bamphen Nuea and then you need to take a left at Seri Thai Road 60 and go into the Buddhist temple grounds. The taxi should know the way, so no need to worry. Our visit was on a Sunday and the place was absolutely packed with people when we arrived just before lunchtime and it was difficult to get a car parking spot. After parking the car we walked towards the entrance, first passing a large gong built inside its own little building. We continued to walk on and followed the mass of people to finally arrive at Klong San Saeb where there was a small footbridge spanning the klong. From here I could see Wat Bamphen Tai Buddhist temple over the other side as well as the food stalls on our side, serving a delicious array of Thai foods. Kwan Riam Floating Market is a Thai market for locals; there were very few foreigners walking around, so if you go the expect to be the exception. 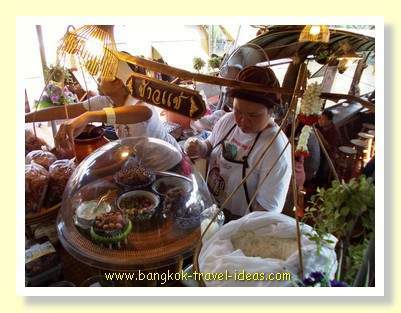 Mostly it is Thai people, both young and old taking the opportunity to have some family time together. We left the bridge area and wandered down to the food hall section of the floating market, where there were all sorts of local Thai foods on sale in an undercover area. We managed to find ourselves a seat and ordered some food from one of the vendors and after a few minutes the food arrived. I didn't take any photos of the food but I recall that it was a very delicious spicy noodle dish. 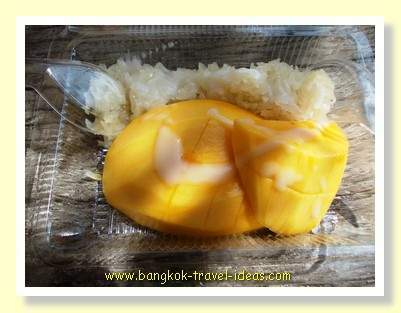 As a dessert I managed to find someone selling mango and sticky rice, which is one of my favourite Thai dishes, and it was absolutely delicious. It was very relaxing to consume this by the side of the klong, with the cool breeze wafting over me. After eating we walked around the food hall and then up the stairs to a second level. This area was also undercover and so we sat down near the balcony to watch what was going on. It was a bit breezier up here and we managed to cool down after the heat of the food hall. Our seats were opposite a stage on the other bank of the klong, where they have traditional Thai dance shows put on by the schoolchildren. As we were in the middle of the school holidays there was no show planned for today, but keep a look out for the school shows as they are well worth seeing. Just down below us, there was jetty for the floating market tour boats and further along there was another bridge to cross over to the temple. As we looked down we could see the tour boats stopping at the jetty collecting and dropping off passenger, so after a brief rest we wandered downstairs and waited for the next boat. We took our turn to get onto the boat and before long it set off. 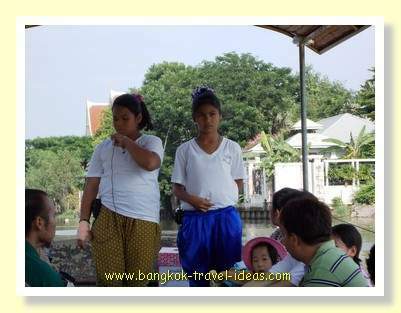 There were a couple of girls that took it in turns to give a running commentary of what was alongside the banks of the klong. It was all in Thai and so I had no idea of what they were talking about. All I know is that once we passed the boundary of the temple grounds then all alongside the klong was basically the back of industrial factories. So there was not much to see and after all you are in the middle of industrial Bangkok, so what can you expect. After about 150 metres the boat turned around. The girls kept talking as we retraced our route, going past the jetty and onward for another 150 metres. At this end we past the small boats moored to the bank and serving all sorts of Thai food, there was also the back of the school and some empty fields before the boat turned around and went back to the jetty. 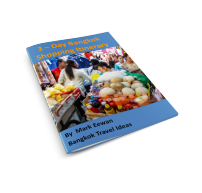 As we disembarked the boat we paid 20 baht each and some tip to the two girls. 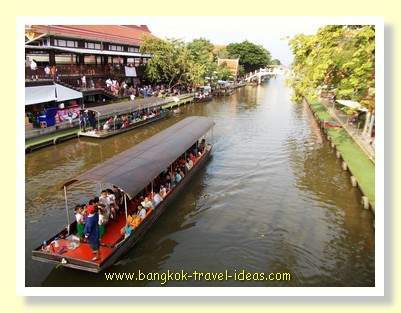 It in no way compares to the firefly tour at the Amphawa floating market but for 40 baht it was a nice ride on a boat and even more so if you have small children. After leaving the boat we had a look along the bank at the small boats selling food. The path was very narrow and could only fit two people side by side, so there was a bit of a crush as we squeezed by the other people. 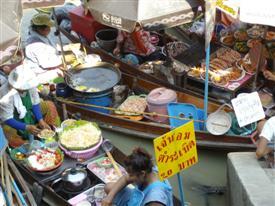 Some of the boats were set up so you could dine on board and some were just selling takeaway food. There were all sorts of dishes on display and it was very colourful the way it was set out. Some of the sellers were dressed in Muslim dress, so I guess that was the style of food from their boat. The smells wafting by were amazing and although we had just eaten we started to feel hungry again. There were about ten boats all selling food, but the funny thing is that once the people got to boat eight then they turned around and went back. It was almost as if the people could see to the end and thought, “Ahh, just more boats” and couldn't be bothered to check them out. 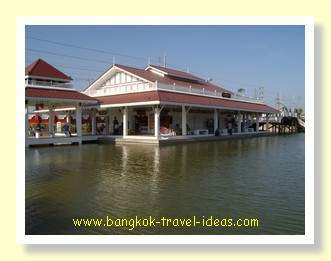 We turned around also and walked back to the footbridge and crossed to the other side of the Kwan Riam Floating Market. 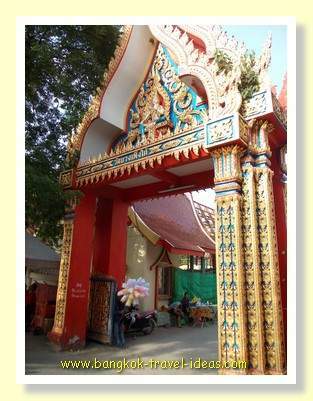 On the other side was the entrance to the Buddhist Temple and a big market. As we walked along there was a lady making coffee and pouring it from one cup to another in front and behind her. I tried to make a recording but wasn’t quick enough to get set up before she finished. There was big crowd gathered around her and she did a great job of not spilling one drop. She was almost a showman or should I say, show woman. 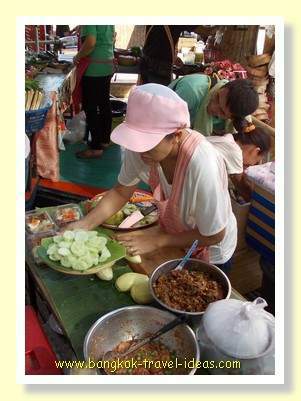 The market was a mix of fresh food, cooked food and ornaments and children’s toys. 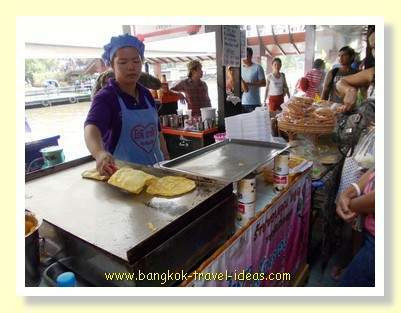 Some of the food stalls were really popular and had great crowds of people waiting. We bought a couple of ice creams and found an upstairs area that had seating and overlooked the klong. Down below we could see the little boats cooking the food and directly beneath us was a planted rice section with a large imitation buffalo and rice farmer. 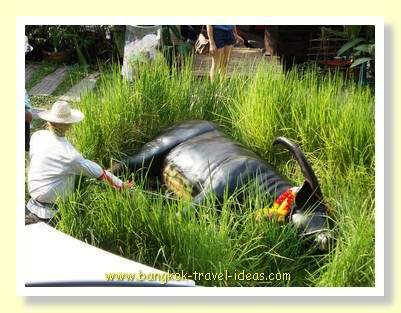 This was a very popular place for taking photographs only someone must have leaned too heavily on the buffalo as the next time I looked it was lying down in the rice paddy. Upstairs it was quite pleasant with the late afternoon breeze blowing by and it was a good opportunity to relax and just watch the boats go by and see what all the other people were up to. 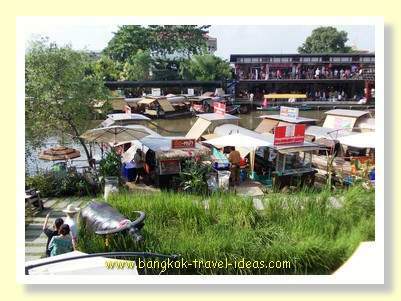 At about 4:00 pm we decided to head home after a very relaxing day at Kwan Riam Floating Market. 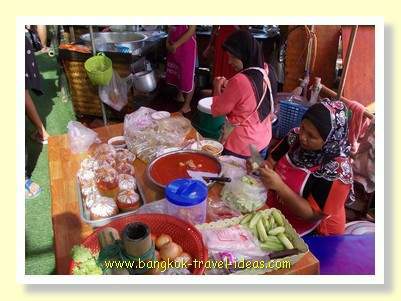 This market is probably about the same distance as Suvarnabhumi Airport from Bangkok and so I would estimate a taxi fare of about 300 baht. 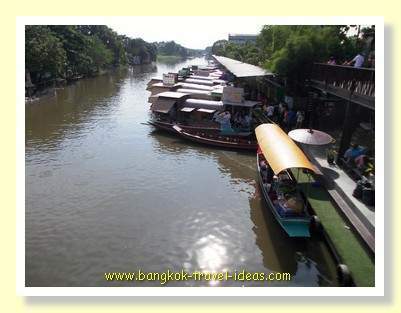 Have a look at the Googlemap below to get an idea of where Kwan Riam Floating Market is located. 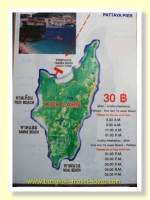 Should take about an hour to get there. I found this interesting clip of the Kwan Riam Floating Market on YouTube and she had a good channel, so I posted it.